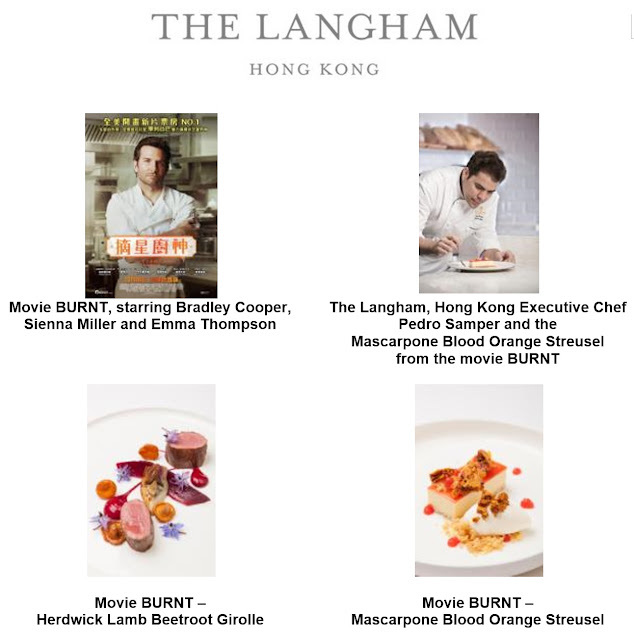 In collaboration with Sundream Motion Pictures, The Langham, Hong Kong presents two signature dishes featured in the upcoming film BURNT, starring Bradley Cooper, Sienna Miller and Emma Thompson. The movie will debut in Hong Kong on 10 December 2015 where the dishes will also be unveiled at The Bostonian restaurant, located in the lower lobby of the hotel. Only ten of each dish will be made available every night for dinner until the end of December. The movie BURNT was shot on location at The Langham, Hong Kong’s sister hotel, The Langham, London. The hotel’s restaurant, The Roux at the Landau, appears undeniably throughout the film, as well as the creations by British Michelin starred chef and restaurateur Marcus Wareing who was the chef consultant for the film. Using Wareing recipes, Bradley Cooper plays a Michelin star chef trying to rebuild his career in London. Bringing this culinary sensation to life, The Langham, Hong Kong’s Executive Chef Pedro Samper showcases a savoury and a sweet inspiration from the feature film. Served in The Bostonian restaurant, guests can experience BURNT plated – Herdwick Lamb accompanied by a Beetroot Girolle and a Mascarpone Blood Orange Streusel where on-screen becomes a tasteful reality. Available for dinner from 10 – 31 December 2015, the Herdwick Lamb and Beetroot Girolle is priced at HK$528 and the Mascarpone Blood Orange Streusel is priced at HK$108, subject to 10% service charge. The Bostonian is open daily for dinner from 6:30 – 11:00 p.m., lunch from 12 – 3:00 p.m., and Sunday Brunch from 11:00 a.m. – 2:30 p.m. Recipes provided by British Michelin starred Chef and Restaurateur Marcus Wareing, Chef Consultant for Burnt www.marcuswareingrestaurants.com.